The USD 480 Board of Education met Monday night at the Education Service Center for a regularly scheduled meeting. 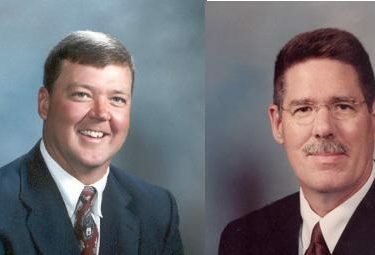 It was the final meeting for board members Cliff Abbott and Bob Maier. Abbott lost a coin flip to Nick Hatcher back on April 10 for the third and final spot on the board. Bob Maier chose to not run for re-election. During the meeting the board set a date for reorganization of the board for the 2009-10 school term. The board chose July 6 at 7:30 to begin the new term. Other action items on the agenda was the renewal of orientation and mobility contract with Southwest Kansas Area Cooperative. The board approved the bid for Abbott Construction for the replacement of west end of the concrete drive on the north side of Liberal High School. This passed 5-0 with Cliff Abbott abstaining and Stacy Johnson absent. The board also approved the bid of Beavers Fencing for the purchase and installation of fencing materials at Redskin Field and West Middle School to be installed in the uncovered areas around the Redskin Field Track and around the West Middle School Track for safety purposes. The board also approved Exam View and the Resolution 06-22-09 which is the financing of the athletic projects.